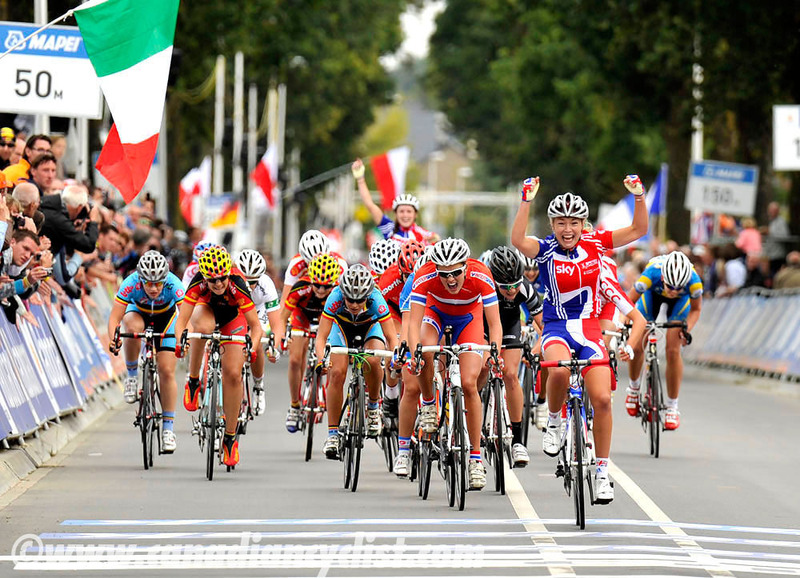 After a day of rest on Thursday, the Road World Championships resumed on Friday with the Junior women's 80.5 kilometre road race. 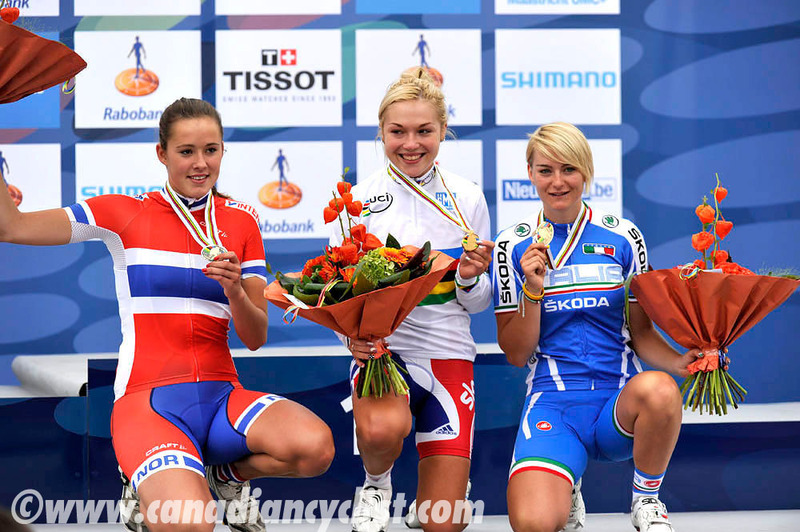 Lucy Garner of Great Britain successfully defended her title in a 20 rider sprint after five laps up the Cauberg, with Elina Brustad (Norway) winning silver and Anna Stricker (Italy) taking bronze. Audrey Labrie was Canada's top finisher in 43rd, in a chase group just 32 seconds behind the winner. The 16.1 kilometre circuit takes the riders out of Valkenberg, on a long descent before climbing the shallower of two climbs - the Bemelerberg. Over the top, riders head through narrow twisty roads before dropping into Valkenburg and tackling the infamous Cauburg climb - the finishing climb for the Amstel Gold WorldTour spring classic. 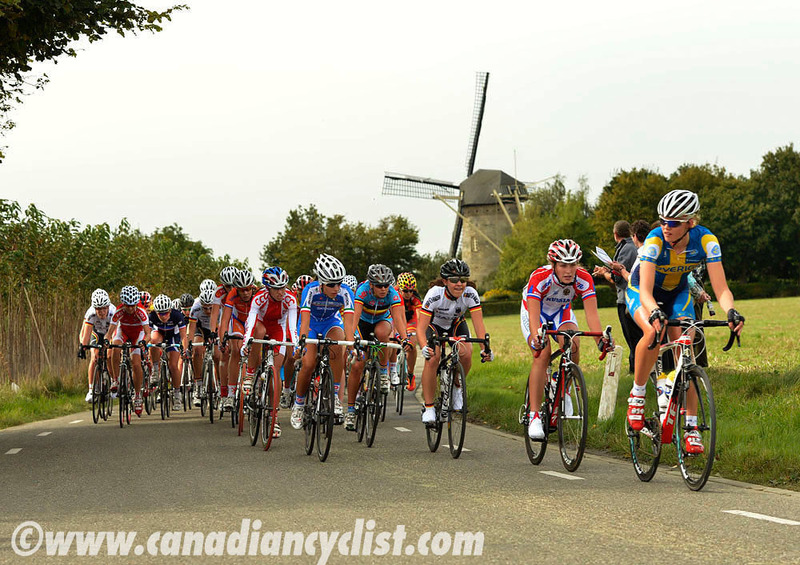 Here, the race does not finish at the top, but continues for two kilometres on the flat to the finish line. A crash on the first lap saw over a dozen riders gapped, including two U.S. riders. 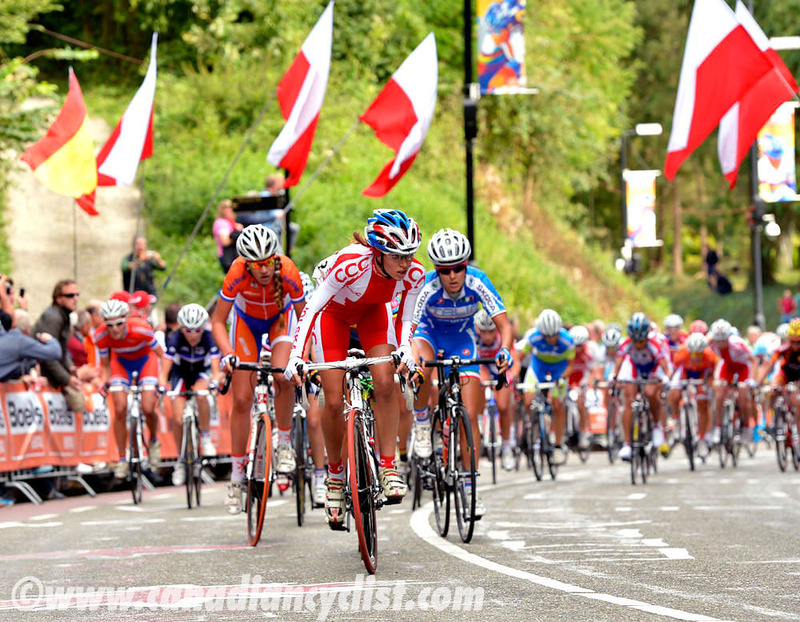 Canadians Ariane Bonhomme and Allyson Gillard were caught by the crash but managed to rejoin the peloton; at least until the Cauberg. The Cauberg proved to be critical in thinning the field. Each lap the top teams - including Netherlands, Great Britain, Italy, Poland and Russia - set a strong tempo up the 12% grade, which stripped off the weaker riders. Many would manage to rejoin over the top and on the descent, only to be dropped again on the Bemelerberg. By the start of the final lap the lead group was down to approximately 30 riders. A few rejoined before the base of the climb, but were immediately dropped as the Italians and Belgians were particularly aggressive on the last climb. Twenty riders came over the top to contest the sprint, with recently crowned time trial champion Elinor Barker setting up her teammate Garner for the win. Garner came to the front with 100 metres to go, and had enough of a gap to coast across the line with her arms in the air. With her win, Garner became the first female Junior to claim back-to-back world road race championships since her fellow countrywoman Nicole Cooke.